Originally from Rm.Valcea , Romania. Last known whereabouts was in Manchester, UK. Mr Constantinescu is no stranger to police in Romania or to the FBI. He seems to be a stranger to the authorities in the UK however. Mr Constantinescu likes to place fake ads on the internet for automobiles and defraud victims in countries like Italy, Poland and the Czech Republic. He ran the site (also listed below) http://trax-holdings.co.uk which is still active but seems to be abandoned. YES I know many more scammers.....stay tuned. Prosecutors Department for Organized Crime and Terrorism - Craiova Territorial Service investigating several people in terms of offense establishing a criminal organization, without the right access to a computer system, availability of computer data, possession of equipment payment instruments for counterfeiting, forgery of an electronic payment instrument and circulation of counterfeit payment instruments. In fact, Note that the radius of Dolj County was formed an organized criminal group, with branches in Olt county and city Bucharest, specializing in computer crime offenses committed. Electronics of skimming equipment were made especially in Chisinau and Bucharest Municipality mechanical components were made in Craiova, where parties make and assemble electronic and mechanical devices obtained were then sold to others or used by group members, especially in Italy. On May 27, 2010, under authorization obtained by prosecutors DIICOT Is carried out searches at home in 38 buildings in Craiova, Jud. River (three buildings) and Bucharest Municipality (6 buildings). At the headquarters D.I.I.C.O.T. Craiova Territorial Service will be led 20 people to interview. Researches were carried out with police officers in BCCO Craiova BCCO Bucharest DCCO - SCCI and employees of the Romanian Gendarmerie and spirit. Prosecutors Department for Organized Crime and Terrorism - Territorial Service Brasov seven defendants investigated for committing the crime of belonging to an organized criminal group in Criminal through computer systems and networks - has the equipment to counterfeit payment instruments electronic payment instruments, electronic forgery, attempted to carry out financial transactions fraudulently and blackmail. In fact, it holds that, in early 2010, defendants Badila Mariean Aurel ink Lucian Marius Ciurea, Bularca Mircea Dumitru Constantin Teslaru Jones and Valentine have joined an organized criminal group, previously established, which acted in Romania and Italy, in order to obtain substantial amounts of money by using equipment for forging electronic payment instruments, the method used was skimming the site and withdraw money from accounts with credit cards clones. In Romania were made or acquired devices used to perform electronic assemblies or reading data recorded on magnetic tape copy bank cards, such as "mouth of ATM and software used for the same purpose, and falsifying bank cards, such as" Exeba . Artisanal equipment made in Italy were to be transported, installed ATMs, and after copying data from cards cloned and used to withdraw sums of money by members of the group. Defendant charged Ţinteşan Calvin Note that, in late January 2010, amid problems with the registration of a car by exerting violence and threats of injured parties, won the amount of 3000 euros, the money is split with other members group. In April 2010 and on May 25, 2010, under authorization obtained by prosecutors DIICOT Were carried out 17 searches in domiciliary buildings in Brasov, Constanta and Hateg, Hunedoara, during which totaled computers and equipment for counterfeiting credit cards, two firearms, side arms and risk drugs - hashish . Prosecutors D.I.I.C.O.T. Brasov Territorial Service ordered 24-hour detention of defendants ink Lucian Marius Ciurea, Bularcă Mircea Dumitru Teslaru Ţinteşean Valentine and Calvin and proposed court for their arrest for 29 days and failing to arrest indicted Badila Aurel Constantin Mariean and Eugene, for 30 days. In that case, on 17.04.2010, have ordered arrest of the other four defendants, members of the group, to form an organized criminal group, possession of equipment for counterfeiting and extortion of payment instruments. Researches were carried out with technical support and Intelligence officers with police officers in BCCO Alba BCCO Constanta, Brasov and IPJ BCCO Brasov and employees of the Romanian Gendarmerie. Research continues to documenting all criminal activities and criminal accountability of all participants. Prosecutors Department for Organized Crime and Terrorism - Bacau Territorial Service ordered 24-hour detention of defendants Aaron Alexander, Edward Mazilu, Buta navigate, Farcas Johnny, Daiciu Alexander Nechifor Cornelius, Costel, and Antonache Mihai-Cristian Gafton Gabriel for offenses setting up an organized criminal group in Criminal through computer systems and networks. In fact, notes that in 2009, defendant Aaron Alexander as leader, was indicted along with others, a criminal organization, with cross-border, specializes in manufacturing handicraft, marketing and operation of media devices to defraud electronic payment, unauthorized copying and transmitting data identification cards belonging mainly to foreigners, making fraudulent financial transactions in the virtual environment by using identification data cards for payment of services and the financial operation through fraudulent cash withdrawals from ATMs. Group members acted both in Romania and abroad, particularly in Germany, UK, USA and the Netherlands. On May 26, 2010, under authorization obtained by prosecutors DIICOT Were carried out searches at home in 10 buildings in the counties of Bacau and Neamt, during which they were removed by skimming devices and parts, electronic components, computer systems, ATM casts of some holes, 1,000 phone cards, SIM cards 160 issued by different mobile companies. Prosecutors D.I.I.C.O.T. Bacau Territorial Service ordered 24-hour detention of the eight defendants and the court suggested their arrest for 29 days. Researches were carried out with technical support DGIPI and with police officers in BCCO Bacau, Iasi, Alba and Brasov S.I.R. the I.P.J. Bacau and I.P.J. German and Mobile Gendarmes grouping employees Bacau. http://www.aa419.org/ is currently under a DDoS attack. "The scammer contacted us, demanding we not publishing any new Shops or bank accounts he is using. Also he told us to remove a certain member from our team. Otherwise he will "ddos endlessly". We basicly told him to eff off. Soon after we received a email with sites he is and will attack, mainly those who are found first on google. Amongst them aa419.org. The scammer is a kiddie from the german carders scene, attacks are via russia, c&c probably hosted at heihachi.net, webalta, wahome, 2x4.ru. " The DDoS attack is coming from Russian servers and is a result of refusals to remove the posts on fake sites. McAfee Site Advisor has these sites listed with warnings. hier derhaha sicher dir bekannt. ich werd eure ganzen mist seiten bis zum geht nicht mehr ddosen habe jetz so einen starken ddos den niemand aushalten wird. ich kann dir anbieten das du nach paar tagen wenn ich die shops gewechselt habe die shops posten kannst. Alles was hier geschrieben wird bleibt unter uns und wenn du denkst das ich nur spass mache kannst du mich testen.Veröffentliche aufkeinenfall diese email sonst sind die verhanldung beendet. here derhaha sure you know. I'll mist all over your pages is to no longer have to endure ddos ddos book now such a strong no one will. I can offer you that you can sit for few if I changed the shops, the shops post. Everything that is written here remains among us and if you think I'm just fun you can email me testen.Veröffentliche aufkeinenfall this verhanldung otherwise have ended. niemand weiss was über mich auch nicht heihachi und heihachi sitzt auch irgendwo in russland und das geld schick ich immer auf ein Konto in russland von einem Konto was einem finanzagenten gehört den ich seid 2 jahren nutze also erspart euch alles. nobody knows what about me and not Heihachi Heihachi sits somewhere in russia and I always send money to an account from an account in russia what is a fiscal agent that I use two years are therefore spared you all things. Here is a new list of fake shops by these scammers. Prosecutors from the Directorate for Investigating the Organized Crime and Terrorism –Territorial office Constanta have dismantled a criminal organized group specialized in computer fraud, and fraudulent operations with electronic payment instruments. The prosecutors are investigating 25 de defendants for constituting a criminal organized group, violation of art.7, Law 39/2003, counterfeiting electronic payment instruments, violation of art.24 al.2 Law 365/2002, conducting fraudulent financial operations, violation of art.27 al.1, 2 and. 3 Law 365/2002, for modifying without authorization computer data, violation of art.48 Law 161/2003 and for money laundering, violation of art.23 al.1 lit.b Law 656/2002. Starting with October 2009, the defendants realized fake WebPages, clones of the WebPages of Bank of America and other banking institutions. They mass emailed links to these fake pages to users, customers of the targeted financial institutions. These pages contained a fake warning to cancel or restrict the access and asking the customers to complete a form with personal information such as name, DOB, address, phone number, SSN, card number, expiring date, CVV2, pin code, etc. After completion, the form was automatically transmitted to an email box especially created for this reason. The collected stolen private users information have been used by the suspects to initiate fraudulent Western Union online transfers from the accounts of foreign citizens. The defendants have introduced in the Western Union computers used to conduct the online payment transactions, fake computer data having as result financial transfers from the bank accounts of US citizens. The money from the fraudulent transfers were picked up from Western Union offices from Constanţa, Viena – Austria, Munchen – Germania and Praga – Czech Republic. Also the defendants distributed to other suspects the stolen private information to be also used in fraudulent financial operations. On 10 Mai 2010 have been executed 36 search warrants, 2 in Bucharest, 32 in Constanta county and 2 in Harghita county. The police seized numerous computers and media devices. I.G.P.R. - D.C.C.O., B.C.C.O. Bucureşti, B.C.C.O. Constanţa, S.C.C.O. Harghita şi S.C.C.O. Buzău and officers from B.S. I. J. Vlad Ţepeş, 300 officers in total. The operation has been realized with the assistance of the US Secret Service agents from the US Embassy. In addition to the fraud sites, Mr Ghitan also was involved with other people in scams involving entering victims bank accounts in the UK and apparently withdrawing funds. i`m a 49 yrs old man of a great honor"
This miscreant also has another clone fake shipping site on a hacked account. The scammer is telling his intended victims that the car belonged to his now deceased son, who supposedly died in Afghanistan. "This car it was my son`s car , he died in Afghanistan fighting our war ( Bush needs to tell me why ! ) this car will be a gift .. my gift in the memory of my son.... $4000 this is all you have to pay , shipping insurance and title transfer costs will be paid by me, all i want is to find the right person.. that person who`ll love and take care of this car in the same way he did... I'd like to make a person very happy and to light a candle for my son once in a while.... I live in Ohio my email is : anth4410@aol.com"
If you think you can purchase a car of this calibre for $4,000 you are sadly mistaken. No one in their right mind is going to "give away" this type of car with the BS story this scammer is posting. 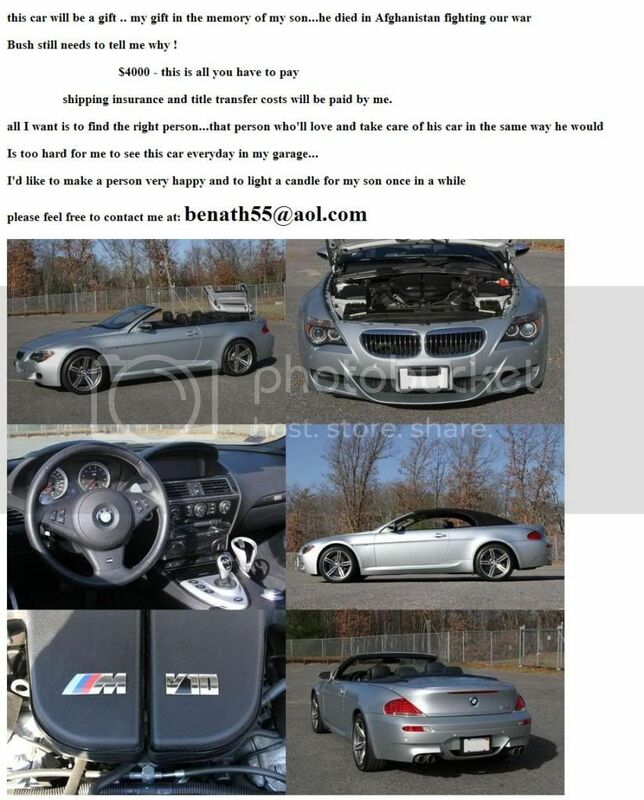 The selling price for a 2007 BMW M6 convertible is between $50,000 and $60,000 in ads on line. If this was a true ad and you go to register the car you're going to have to pay a state sales tax. Lets say the state you live in will accept a value of $50,000 on the car. This means you're going to have to pay about $3,000 for the taxes. Realistically, you're also going to have to pay exorbitant insurance rates. What seems to be a great deal is going to be very costly to the people that send the $4,000 asking price for something that doesn't exist. The scammer is asking his intended victims to use MoneyGram for payment. We all know that it is common for scammers to ask victims to use instant money transfers for purchases. If you send the money using this type of service you will never get it back after its picked up.